Do you remember where you were on July 4th, 2012? If you are an American, perhaps it's not so difficult to recall that day. You might have been enjoying a barbecue with your friends and family to celebrate the national Independence Day. For others, it might not stand out so acutely in your memory. Maybe you were enjoying a holiday on the beach, or maybe it was just another hard day at work (it was a Wednesday, after all) in the middle of a hot summer. For a physicist, and especially for a particle physicist, it’s not hard to reminisce about exactly where you were on that day. Why? Because that is the day the collaborations of the ATLAS and CMS experiments at the CERN Large Hadron Collider (LHC) announced the discovery of the Higgs, the only particle predicted by the standard model of fundamental physics yet to be discovered. The July 4th seminar was the culmination of almost 50 years of searches. It is not very often that physicists discover a new particle, and everyone was on the edge of their seats when CERN announced that a seminar had been scheduled just as the searches by ATLAS and CMS were reaching fever pitch. 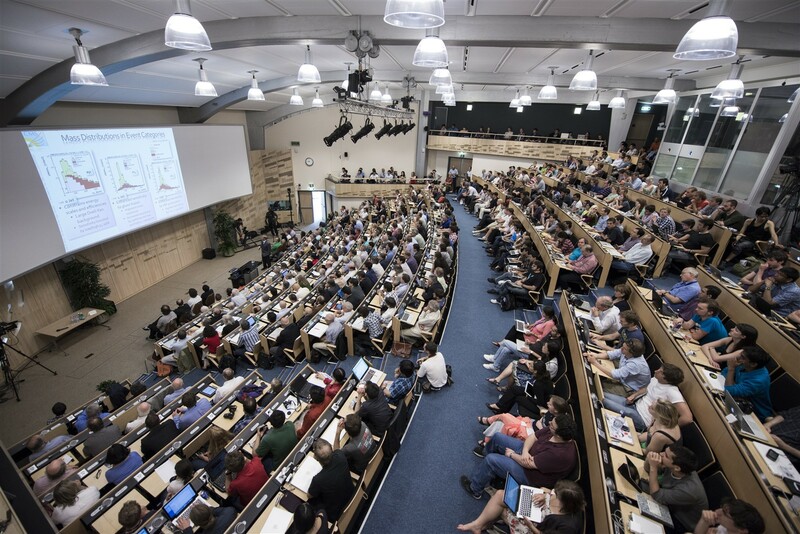 As a graduate student working on the CMS experiment, I remember exactly where I was that day: in one of the last available seats in one of the furthest back rows of the CERN main auditorium, for which I had to be in line around 4am that morning for a seminar that started at 9am. Several famous physicists were in the audience at CERN, including two who would share the Nobel Prize in Physics the next year for predicting the existence of this particle way back in the 1960’s: Peter Higgs and François Englert. Everyone knew that it was a momentous occasion. The Higgs was searched for in CMS by looking for several different signatures in the detector. Since the Higgs is unstable, we can only observe its decay products and not the Higgs itself. And because the mass of the Higgs is about 125 GeV (nobody knows why, more on that later), it decays in many different ways: to bottom quarks, W and Z bosons, tau leptons, and also photons. The Higgs can also be produced in several different ways. Each of the production mechanisms provide unique information to help determine whether what we see in our detector is coming from a Higgs particle, or from something else far less interesting. In order to make the search as sensitive as possible, CMS performed five separate searches for particular Higgs decay signatures. Each of these searches had their own unique advantages and challenges, and only by combining all of them together was it possible to discover the Higgs. Figure 2: The significance of the Higgs signal as a function of its mass from the dataset used by CMS for the discovery. To claim a discovery the local p-value, which represents the probability that the background could fake a signal, must be smaller than about 0.0000003. To reach this level, CMS combined the significance from the searches in 5 different decay channels, assuming their relative ratios were the same as the standard model. Now, on July 4th 2018, we are celebrating the 6th anniversary of the Higgs discovery. We have been busy trying to learn more about this new particle since 2012. Personally, I have been working for the last two years on making new combined measurements of the various Higgs production and decay signatures, similar to what was done when we made the discovery back in 2012. With the larger dataset we have now collected, however, we are able to make far fewer assumptions about the Higgs and measure its properties directly. The coupling strength of the Higgs to different particles, like the top and bottom quarks or W and Z bosons, affects the production and decay rates of the Higgs. When we first discovered the Higgs, we assumed that all of its couplings were scaled by a single common factor. We are now able to independently measure almost all of the individual production and decay combinations, with varying uncertainties, allowing us to make a determination the Higgs coupling strengths. Measuring the couplings of the Higgs is one of the most important goals for CMS. The explanation of the Higgs boson put forward by the standard model of particle physics seems to work well, but leaves physicists unsatisfied. The Higgs explains why certain particles have mass, but it doesn’t explain why they have the masses they have. This is especially true about the mass of the Higgs itself, since the standard model offers no reason why its mass shouldn’t be several orders of magnitude larger than it actually is! Many alternate theories of particle physics have been invented, and they often predict Higgs couplings distinct from the standard model. If we measure the couplings to be significantly different than the standard model, it will help resolve which of these alternate theories is the true one. On the other hand, if we measure the couplings to be close to those predicted by the standard model, we will be able to rule out many of these alternate theories. Its a program guaranteed to advance the field, and a beautiful example of how science is meant to work. Figure 3: Some of the latest results from CMS showing the combination of different Higgs measurements. The plot on the left shows the measured signal yield relative to the standard model expectation for 22 different production and decay combinations. These measurements allow the coupling strengths of the Higgs to other particles to be determined. The plot on the right shows the measured coupling strength of the Higgs to standard model particles and demonstrates that the coupling strength is found to be proportional to the particle’s mass, in agreement with the standard model prediction. In honor of the 6th anniversary of the observation of the Higgs, we in CMS are putting together a series of 6 short videos describing these important measurements of the various Higgs decay signatures and production mechanisms that helped in making the discovery. These videos describe the unique aspects of each measurement, and what makes them interesting to the physicists who work on them. We also want to show how these searches continue to provide new information about the mysterious Higgs particle. We hope you enjoy the videos, and happy anniversary to the Higgs!